Data center, Enterprise IT, and general consumer server environments have a broad range of requirements - from basic connectivity to extreme data storage capacities. Effective data access and protection is crucial to their ultimate success. 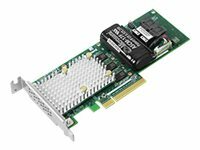 SmartRAID 3162-8i adapter is ideal for high performance enterprise servers that require maximum connectivity. This controller-based encryption option, SmartRAID 3162-8i /e, supports security enabled server platforms and provides the industry's only data-at-rest encryption solution.